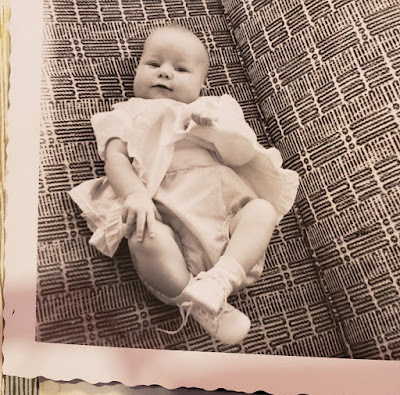 My mid-century roots started with my parents sofa - check out that fabric! I've designed a lot of kitchens over the years, but never one with mid-century styling. But I got to thinking - I grew up with mid-century kitchens, maybe they could provide some inspiration? 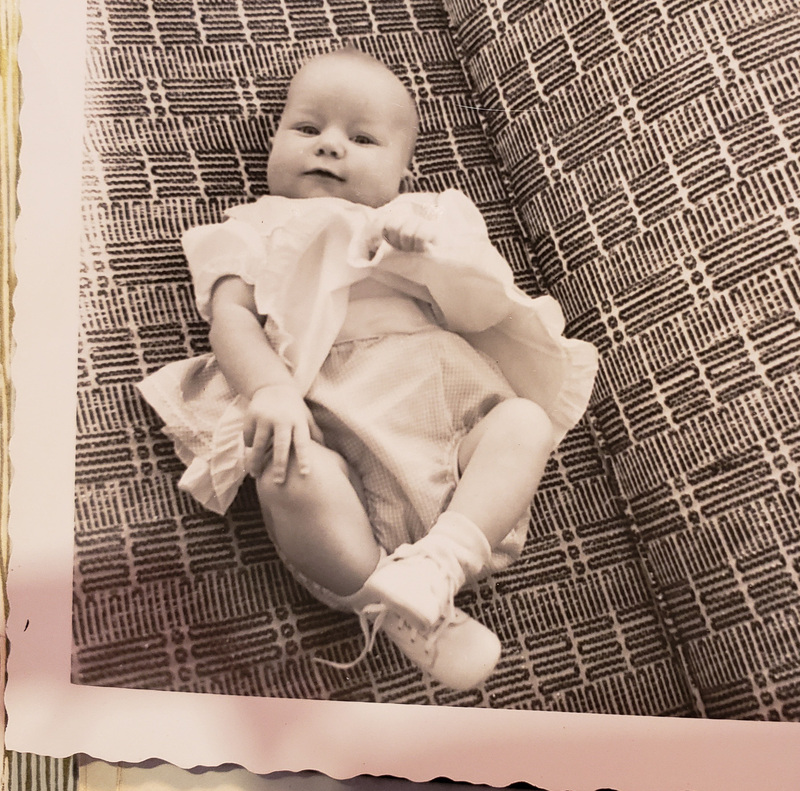 Just look at that MCM fabric on the sofa when I was a baby. That's the real thing! 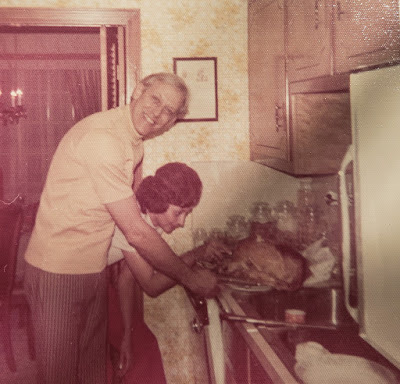 The earliest kitchen I can remember from my childhood was in the late 60's in Maryland. 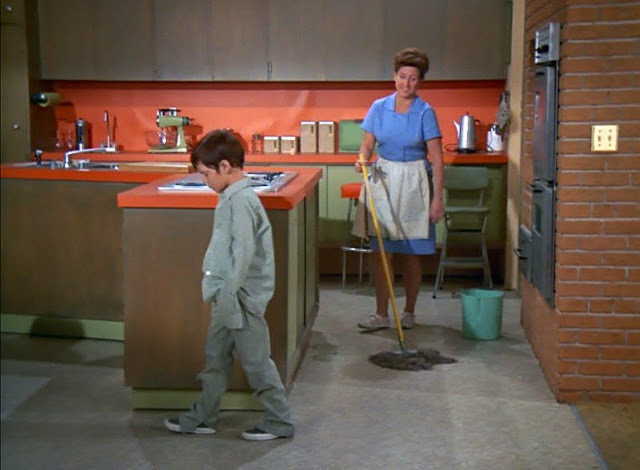 It had metal cabinets that my mother painted turquoise and stainless steel countertops that she would scrub with Ajax every night after dinner. The smell of Ajax (does anyone still use Ajax??) still transports me back to that kitchen!!! Our next kitchen was around 1970 (Colorado). 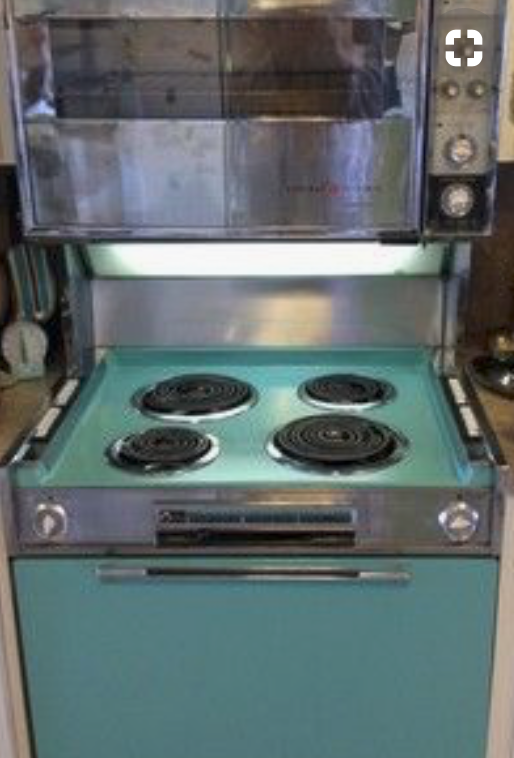 It had a turquoise stove (she really loved that color!) that had white push buttons along either side for the high-medium-low settings. It also had white Formica countertops with little flecks in them. This was followed by a galley kitchen in 1974 with boring brown cabinets and Harvest Gold Formica countertops. They looked fantastic with the Avocado Green appliances and matching shag carpeting throughout the house. 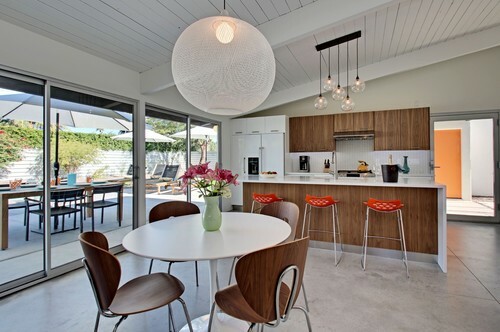 Just take this Brady Bunch kitchen and swap out the Burnt Orange counters with Gold and you've got it! This was a big color departure for Mom. Farewell turquoise - hello mid-century trinity!! Okay, on second thought, maybe those kitchens won't provide the inspiration we need. I really don't think I want to use any of those ideas and I still dislike that color palette! 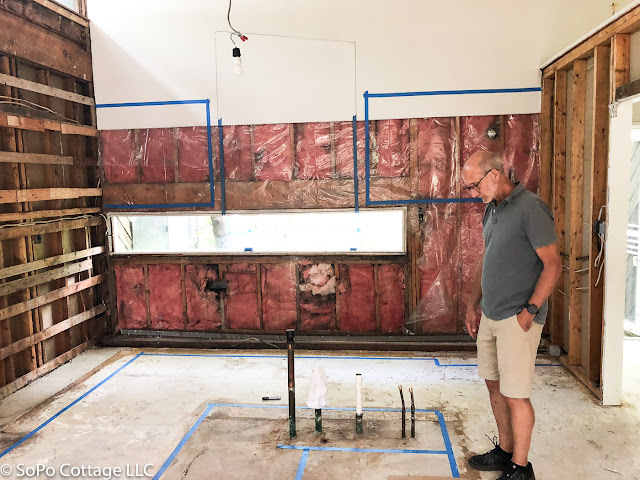 The only idea that might have some merit is the countertops....hold that thought......there may be a kernel of design inspiration there. Now here's the conundrum. We want to stay true to the mid-century design intent of the house. But we really don't want a slavishly mid-century kitchen. 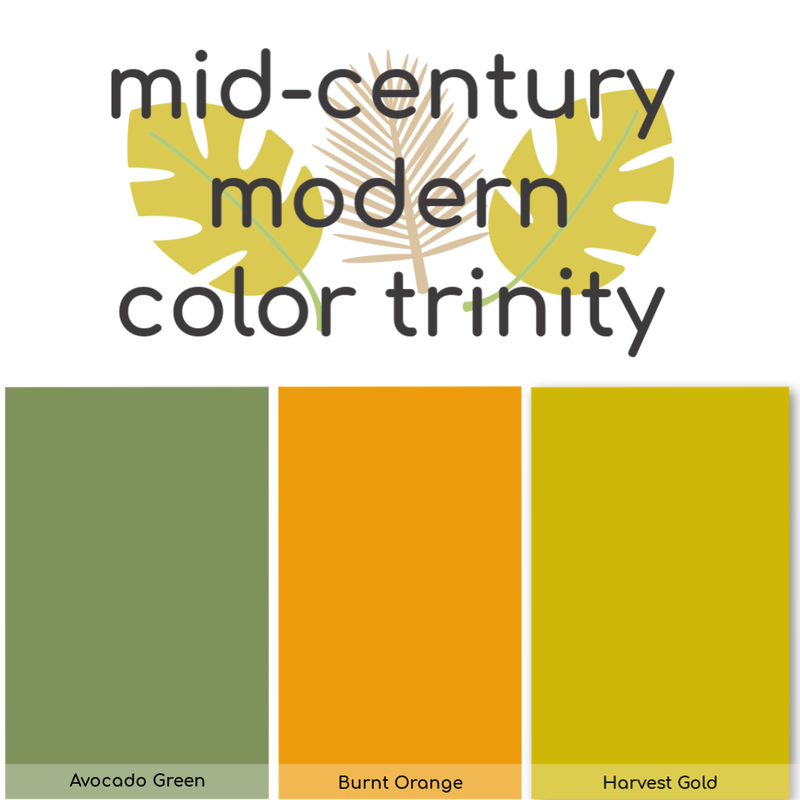 And I'd like to stay away from bold colors on major elements like cabinets and appliances - we can do a lot with accessories to introduce color (so forget about that turquoise or avocado green stove!). So I started reading and pinning and coming up with ideas. And I found some pretty great inspiration! This kitchen has a lot of elements that appeal to me. Maybe because we have a similar ceiling line and big sliding glass doors. 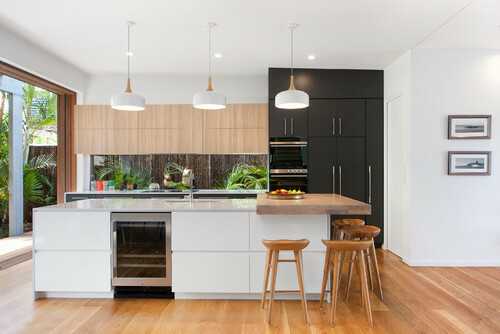 I also like the mix of the dark and white cabinetry and a big, dramatic light fixture. 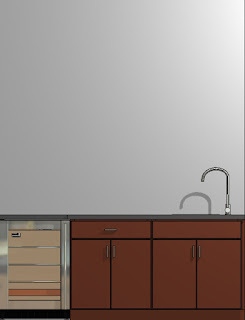 Or this one, again, with dark cabinets mixed with white. This is also a nice inspiration. And so the design started to take shape. We taped it out on the floor and the walls, to see if it would be comfortable for us to work in. And after a few tweaks, we were pretty happy with it. (You'll notice the pipes sticking out of the concrete floor. That's where the plumbing was laid under the concrete in the original kitchen and to keep things simple, we will be leaving the kitchen sink in the same spot.) And the tall pencil line you see on the back wall?? That's going to be a giant window that will provide some ventilation and a view of the courtyard. 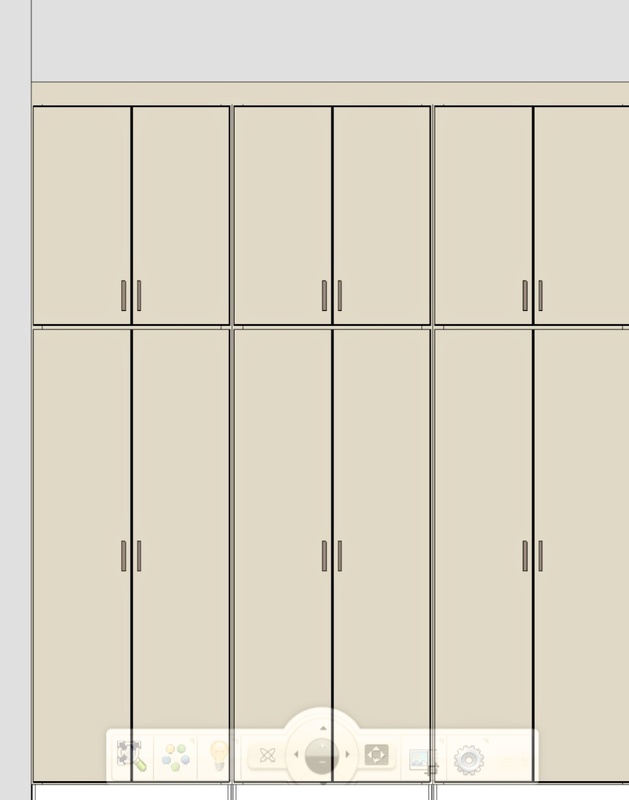 First and foremost, we're going to use dark slab front cabinets (solid quarter sawn oak, stained walnut) for the base and around the refrigerator and white cabinets for the uppers. I know you see a lot of veneered cabinet fronts, but we wanted to stick with all wood. I'm still agonizing over hardware.....I like the sleek look of no knobs at all - with pressure latches - but think that might be awkward (and would we have shiny spots where we pushed to open them all the time?). So maybe some slim, finger pulls? Hmmm..... Thankfully I don't need to decide that for awhile. The island will have seating for 6 (count em 6!) people!! I love having a place for friends and family to gather around. We do a lot of entertaining and since everyone ends up in the kitchen anyway, this will be a big space for a crowd. And since the kitchen connects to the bar and the mudroom, we've included them in the design. 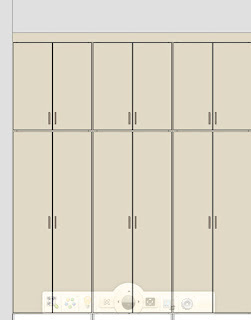 We will put giant, 8 foot tall pantries in the mudroom. This will give us a lot of additional storage. 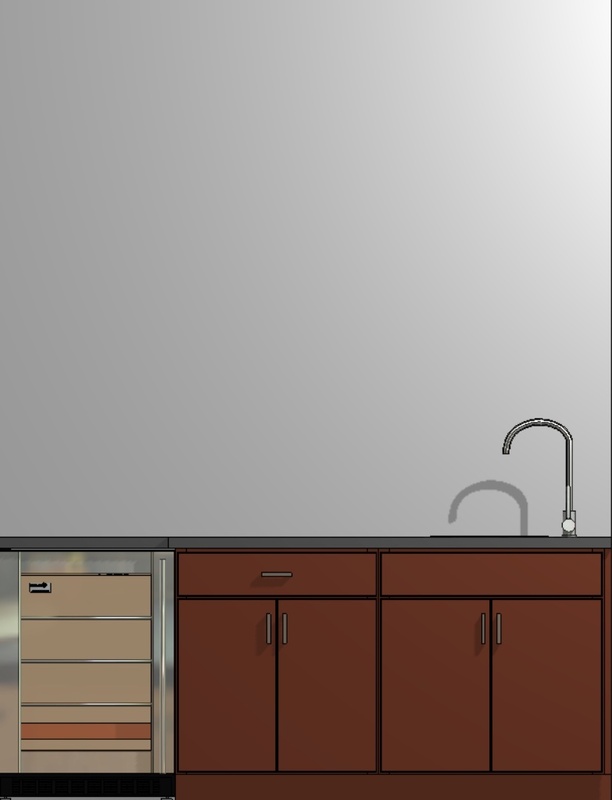 And we're going to use the original bar sink for the bar and add new cabinetry and a wine fridge in there. Finally, I want to include an accent for the backsplash. 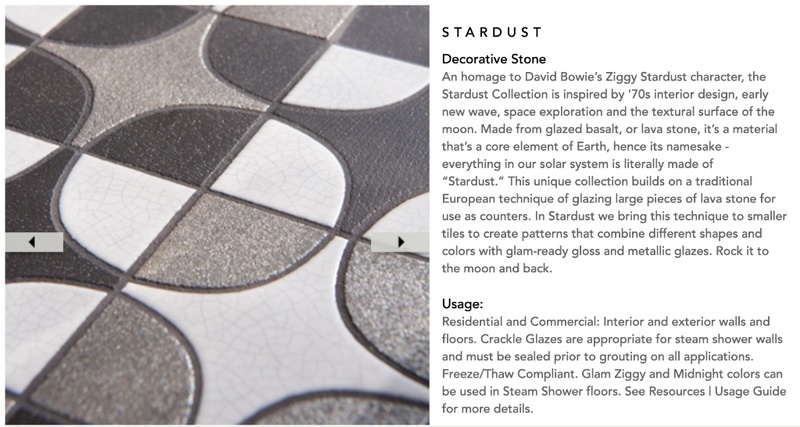 So behind the range, I'll be installing this amazing tile from Walker Zanger. It caught my eye when I first saw it.....and when I looked it up online I discovered it's part of the Stardust pattern. It pays homage to David Bowie's Ziggy Stardust character and is inspired by 1970's interior design. Seriously??? It's perfect for our project!! Once we decided on the cabinets and backsplash, we needed a countertop. And as I started doing more reading and research, we realized that something that looks like the Formica of my childhood would probably fit the bill. But we want to use a quartz product, to make maintenance easy. After looking at different options, we decided on this quartz called Winter Storm. It ties beautifully with the backsplash, but has enough speckles in it that it won't show every single crumb. 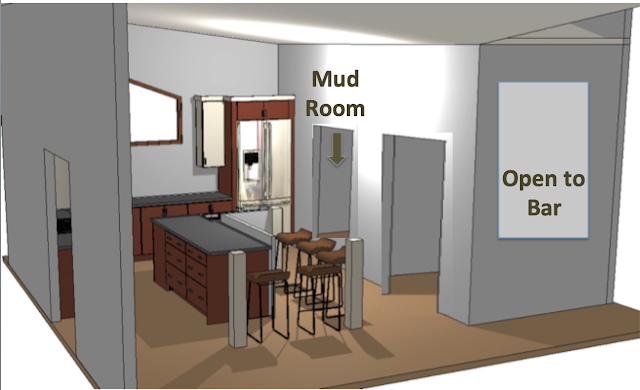 For the tall counter in the seating area, we're debating butcher block or stainless steel. The last piece of the puzzle is lighting. 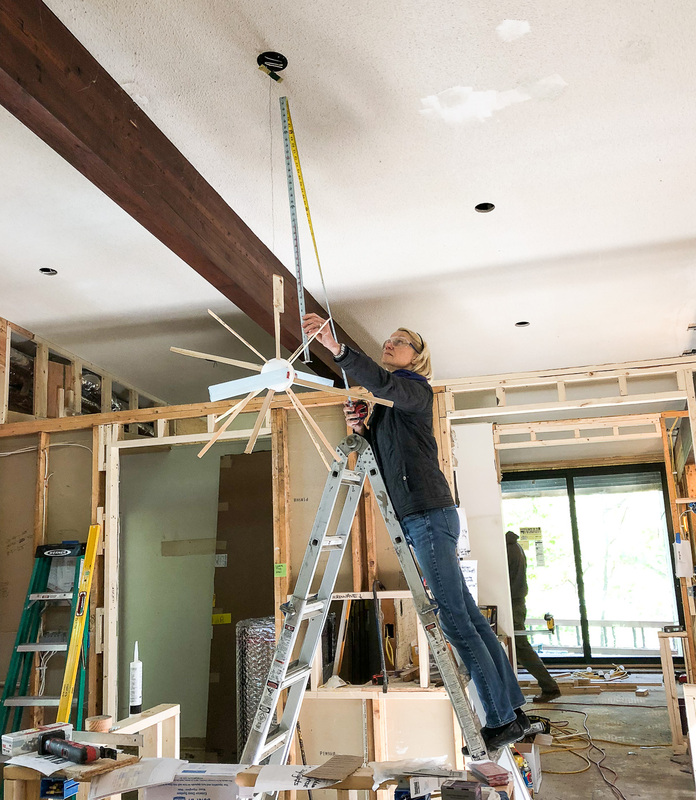 With our tall ceilings, we want something that's a bit of a 'wow' from a mid-century perspective. Richard and I spent a ridiculous amount of time on this, but finally found something we both liked - a sputnik style fixture (hmmm....maybe that ties to the space exploration theme of the tile!). Now, the basic rules for choosing lighting is to add the number of feet that make up the length and width of the room - and take that number in inches as the size fixture you should look for. In our case, that is 15 feet plus 20 feet = a 35 inch diameter fixture. But with our tall ceilings, I was worried it wouldn't be big enough, so I made my homemade sputnik - which looks a bit like a kid's bad science project - and hung it up so we could check it out. Seems silly, but it made us confident enough to order the fixture. My pathetic science project!! Sputnik light fixture mock-up!! How will it all come together??? This mood board captures some of the elements. 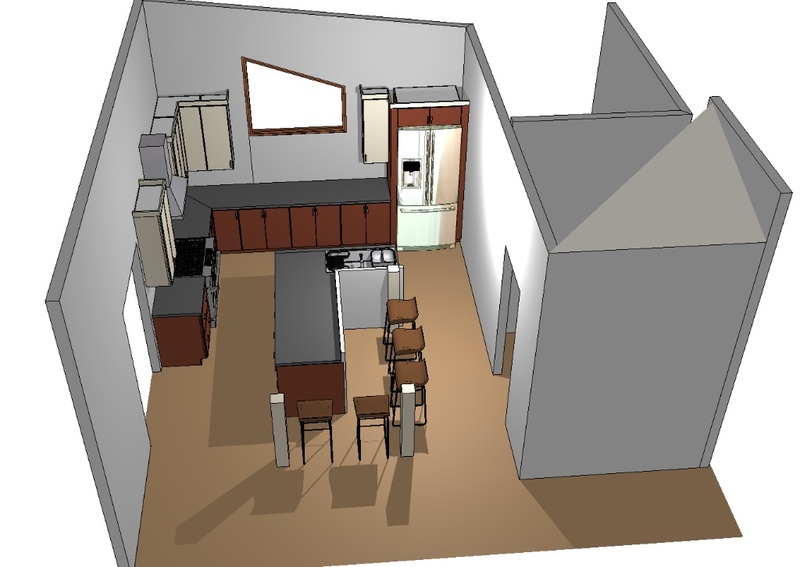 Now the cabinets, appliances and lighting are on order and we're ready to go! Hopefully we have captured that mid-century vibe, but with some modern elements as well. When my mom bought our circa 1959 house it had a turquoise wall oven and cooktop with those white pushbuttons. She removed and spray painted the oven door brown (to match our new brown fridge) but the cooktop stayed turquoise for 45 more years! And she had autumn toned multi-colored shag carpeting installed over the original oak hardwood. Someday, someone will be glad to see that lovely old floor. Your cooktop lasted 45 years!!! That's amazing - pushbuttons and all! I wonder what the typical lifespan is for a cooktop today?? I like the inspiration pictures. I think you're on the right track. I grew up in the 60's/70's and I do not think it was a good look. 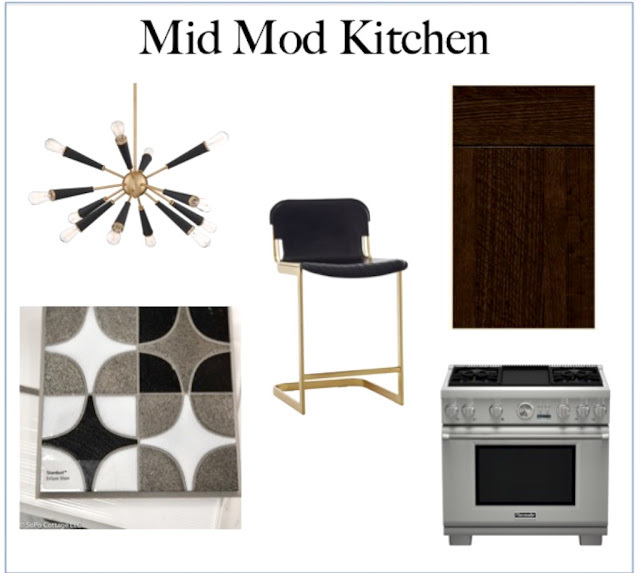 The modern interiors you show, with some MCM accents, will be great for that house. The first kitchen I remember from childhood was pink and avocado. I wish I could get my hands on the pink appliances my mother had, but I'd pass on the avocado chairs. I am very inspired by the scope of the projects you take on. 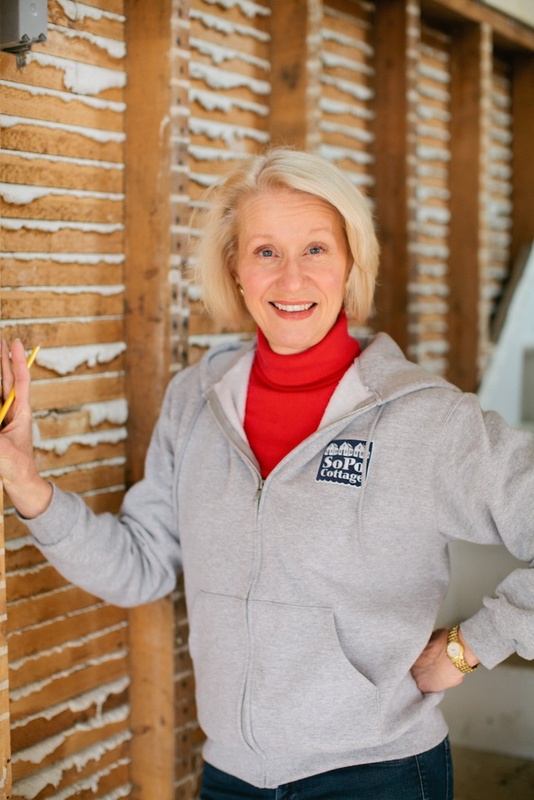 It takes us forever to get on with the small projects on our to-do list!